HOHENFELS, Germany — Isaia Falealii, the son of an American Soldier, attended Hohenfels High School from 2004 – 2008. In 2006, he played defensive for the Hohenfels Tigers football team and won the U.S. Forces European Championship. 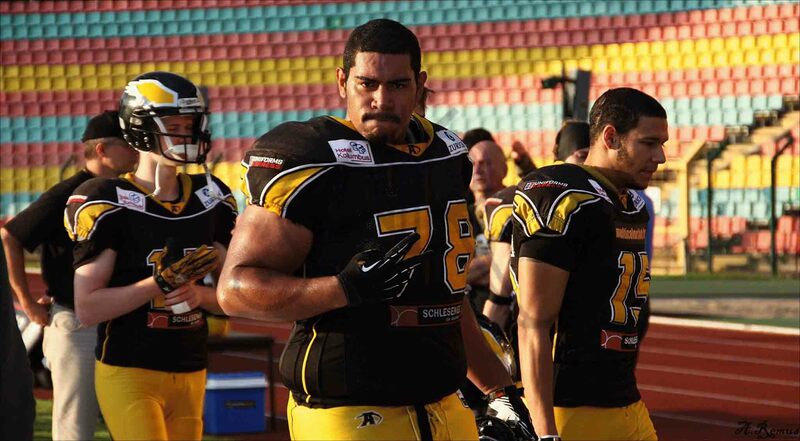 Soon after graduation from high school, Falealii started studying at Lincoln University in Missouri, where he played Division II football as a defensive lineman. After only one season, he moved on to Division I ball at Missouri State. He continued his studies in economic communications for another 3 years until 2012. Once Falealii completed his studies, he followed his heart and headed back to Germany, his home country. Berlin Adler — one of the most successful American football clubs in Europe — committed the then 22-year-old as a clutch defensive lineman. Since August 2016, Falealii has been working for U.S. Army Garrison Bavaria’s Child & Youth Services in Hohenfels. In 2017, he joined the Nuremberg Rams football team. I had the opportunity to ask Isaia some questions. Who introduced you to football and when? I started playing football as the age of six. But my dad got me hooked at the age 12 and supported me every step of the way — so did my family and friends. Also a big supporter was my former coach in Hohenfels, Mr. Shawn Rodman, who we won the European Championship in 2006 with. What motivates you to go out on the field? When I am on the field I can leave the stress and distractions behind me. It’s all about football, and how to play the best game — to support and encourage each other. Of course it’s a big plus to win the game. Why did you choose to work for the CYS in Hohenfels? Most of my life I have lived in the Vilseck/Hohenfels area and consider this my home town. I always wanted to give back the respect and support my family and I received while my dad was stationed here. Working with children is so rewarding. Getting them to learn, seeing their open minds and how they love to be coached and teach is the best reward. What are you goals and dreams?